We are in the middle of a major website overhaul, including full transcripts for all episodes. Or a search that helps you locate exactly what you are looking for (Ex: Facebook Ads). We have been thinking of bringing in a new media buyer, but with some of the Facebook changes (for the better), I have been questioning whether we need to bring someone in as it does not take me that much time to do myself. The original benefit with Facebook Ads was that we can choose exactly who sees our stuff. As you would start to run ads at scale, the depth of being able to choose exactly who you wanted to target made an Ad Manager nearly necessary. Compared to even two years ago, my ad page in Facebook looks so much simpler now. Facebook's system has improved massively and made it much easier. Now, we give Facebook all the data we have, we tell Facebook what we want, and Facebook will use their incredibly intelligent system to find the ad space that works best for you. Before, you used to have to almost lie to Facebook to get what you are actually looking for (like telling them you want reach when you want ROI). Now, their system works much better and you just need to tell them your exact target objective. Sometimes, these podcasts can feel a bit too advanced and targeted to those people with successful stores. If you are new and looking for some early help, go to dropshiplifestyle.com. Hey, what's up everybody? Good morning. 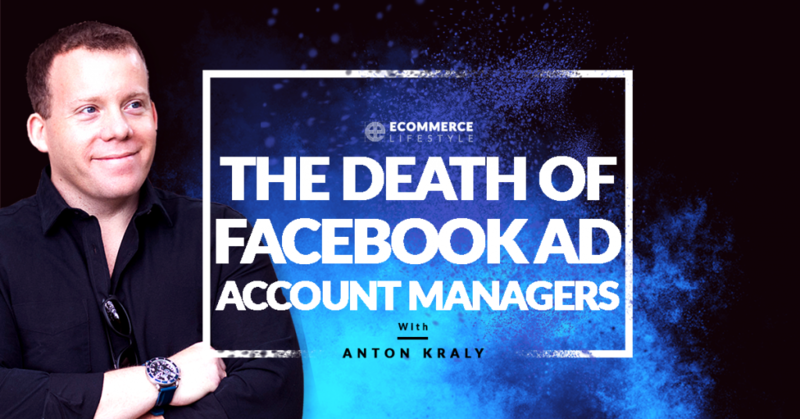 Anton Kraly here, and welcome to another episode of The E-Commerce Lifestyle podcast from ECommerceLifestyle.com, which by the way, we are currently working this week on a major website overhaul, so if you go to ECommerceLifestyle.com now, I think we have most of the updates live. We should by, if not today, which I think is January 22nd, I think, then by tomorrow, but it's really cool. We have full transcripts of every episode I've done in the past, so anything you want to know about, instead of having to go and listen to however many episodes I've done, I think like 50 or something, you can just type in the search box any keywords, maybe Facebook ads, like we're going to talk about today, or whatever else it may be that you're interested in, hit enter, and you'll find that keyword on all the podcasts that I mentioned it. So pretty cool. I'm hoping that website becomes just a really big resource, again, for everybody looking for insights on anything when it comes to E-Commerce, drop shipping, lifestyle businesses, even importing and private labeling. I've spoken about all those things on this podcast, and because they are all now transcribed, you can find exactly what you want pretty much instantaneously. Pretty cool. Anyway, what I wanted to talk about today is something that's been on my mind for maybe the past month or so. At my company, we were thinking, and I can't say we're totally not anymore, but we were thinking of bringing on a new media buyer that is primarily focused on Facebook ads. So Google ads, got that covered. We wanted to bring someone in to manage the Facebook account, but as you probably realize if you've listened to the past two episodes I've done, you know that things on Facebook have been changing, and for us because of the way we're structuring our campaigns, they're changing for the better, meaning we're getting a better return on ad spends. And that's why right now I'm seriously questioning, is this something I should keep doing myself or should I bring on someone that, with incentives, is a six figure position? So right now, it's not taking me much time at all to do, and we spend, I think this month we're going to spend probably close to 200 grand on Facebook, and it's, again, barely taking me any time. So that's why I wanted to do this episode, I gave it a dramatic title. I know. It's called "The Death of Facebook Account Managers", but I really think that's the direction that we're heading. Let me explain why. I guess first of all why they were necessary, Facebook ad account managers, if you wanted to scale, and why as of right now, again, things might change, but in January of 2019, so far, we're doing better with less money spent. And that's not to say we haven't had amazing people managing our Facebook accounts, that's to say that Facebook is changing. So when you think of why Facebook originally ... when did they start Facebook ads? I don't even know. A few years ago when their ad managers was really built out, maybe like 2015, so four years ago, five years ago. The big benefit was Facebook has data on everybody. They know more about you. You've seen that meme where there's a kid on a computer and he says, what does it say? "My dad says Facebook is spying on us." And then the meme has someone looking over their shoulder, and it's Mark Zuckerberg looking over the kid's shoulder, and it says, "That's not your dad." So yeah, Facebook knows every single thing about us, and the benefit originally was that we can choose who sees our stuff. I'll give you an example of actual products, right? Something very age and gender specific. Let's just say that you sold male enhancement pills for men that were older and were having problems down there, okay? So back in the day, if you wanted to advertise these things, your traditional advertising would be, you could buy a TV slot, and of course you could try to find programing that matched your target market. You could also do things like buy billboards and do print media, and really just hope that the people that, let's say it's the billboard, that are driving by are the people that are 60 years or older, and are men, and are having some trouble and need some help. But if you did that, you also have 16 year olds driving by, and kids on their way to college, and basically you're spending money to get impressions, to get eyeballs from people that aren't going to be interested and not going to buy your product. So there's a lot of what I would refer to as leakage, where your money used to go in terms of ad dollars spent. Because again, that's like a shotgun approach where you're just trying to be everywhere, and hopefully some of the people that see it are your right people. So then Facebook comes along, and they weren't the first to do this, but they were the biggest, and Facebook comes along and gives you the option now. Okay, go into your account, your business manager, go into your ad account, make a campaign, and let's just call it ... you can't advertise male enhancement pills on Facebook by the way, so probably a bad example, but you get the point. Let's just say you go into your Facebook account, you make a campaign called Male Enhancement Pills, you make a couple different ad sets. Maybe you have one that's men 60 years or older in the United States, maybe you have one, men 60 years and older in Canada, and so on, and so on. Back in the day, that's what we used to do, that's what everybody used to do, and by breaking your different audiences and different ad sets, you can make sure that your ideal people were the ones who were seeing your ads. This is where it went from there and why ad account managers got necessary at scale. What we used to start looking at is, okay, now we see that men 60 years and older in the United States are doing well, let's break that into men that are maybe 60 to 62, then let's make an ad set of men that are 63 to 65, and maybe 66 to 70, and we would start getting more granular, and the reason we would do that is so we can track different return on ad spend at different levels. So maybe the men 60 and older ad set is doing amazing, but let's see if we can break it down even further and see if there's one age group that is totally out performing. Again, maybe it's men 60 to 62, that's the sweet spot, that's where we're going to pull out all of our profit from, that's where we should dump all of our ad dollars into to get the best return on ad spends. That's how it used to be. We break it down that way. Then, Facebook started to give us more data. So they would show us, well, okay, these are the people that are mostly buying from you, and they would show us, hey, 80% of your sales are coming from desktop. So desktop for men in that age range. So then the Facebook ad manager job would be to go into the Facebook ad account, then take the ad sets, break them down even further, have men 60 to 62, United States mobile, men 60 to 62 United States desktop. Then, to take it even further, they bought Instagram. So maybe we have three different ones. And it just kept going, and going, and going. And then we started to layer interests, and it got to the point where Facebook ad accounts, you really, really did need someone because it was a full-time job to get in there and segment things really deep. Again, if you're running ads at scale, or if you were running ads at scale. So I hope that makes sense. Just know that the reason we did that, again, is to make sure that our return on ad spend was totally maximized, and so that we could see where we were really winning, where we were making money, and where we weren't making as much so we could cut that out. That sounds like a lot of work, right? But it also sounds like it's worth it, so why don't we do that anymore? Because now, if you see our ad accounts today, if you saw inside my campaigns versus what they looked like even two years ago, they look so much simpler now, and the reason they look so much simpler now is because Facebook's whole ad platform, the way they've added to it and rebuilt it, and more importantly, Facebook's AI, their artificial intelligence that learns what works and what doesn't is just so much better than myself or than the smartest ad account manager could ever be. So here's the main difference. Back in the day, again, instead of getting granular like we used to, now what we do is make a campaign like I mentioned. I won't go into the whole structure because you can just go back to the previous, I don't know if it was one or two episodes. Probably both. Listen to both of them. But now, what we go in, is we make these campaigns, we set them for campaign budget optimization, and really what we let Facebook do is find our people for us. So they go out and they do the testing, whether it's mobile or desktop, whether it's Instagram, whether it's Instagram stories, Facebook stories, whether it's the audience network, whether it's in stream videos, we just basically make our ad sets inside of conversion budget optimized campaigns. We give Facebook all the data that we need from a high level. Things like look alikes, things like interests that we know work for us, but then we don't do any placements. We don't segment out Instagram, we don't segment out audience network and Facebook newsfeed and Facebook [inaudible]. We don't do any of that. We give Facebook all the data we have, and then when we bid on Facebook, this is really important, we tell Facebook what we want. So when you're bidding, when you're in your campaign manager, you can choose how you want Facebook to optimize. And again, back in the day, you used to be able to game the system and kind of, I don't want to say lie because that's not the right way to say it, but if what you really wanted was sales, sometimes back in the day, it was better to tell Facebook, "Hey, I just want reach." Right? "I'm not going to optimize for conversions, I'm just going to optimize for reach or for impressions." And there were ways to almost outsmart the system. You're never going to outsmart it, but kind of like some loopholes. Well now, none of those loopholes make sense at all because Facebook is smarter. Their artificial intelligence is better. So what you want to do is make sure, this is really important, when you're choosing your bidding strategy, you're actually choosing what you want. So one of them, one of the things you could bid for is target return on ad spend. This is what Facebook will try to get you for return on ad spend. Let's just say back in the day, maybe one of your campaigns had a 15X return on ad spend, one of them had a 10X return on ad spend. Well, what are you okay with? What's your target and how big do you want to scale? Because if you're okay, and if you said, "You know what? If Facebook can get me a 12X return on ad spend on 10K a month in budget," or whatever, "100K in budget, I would take that all day long." Then when you're making your campaign, tell Facebook that you want to optimize full return on ad spend. When it says, "What do you want your return on ad spend to be?" Put 12. That's what you want. And then just let it run, let it do its thing. Tongue twister. And don't even worry about trying to ever see what works best because Facebook will find what works best for you. They know what you want out of your ad campaign because you literally tell them when setting it up, so they allocate your money to where it's going to best be spent. Again, whether that be Instagram or mobile or desktop or audience network or whatever it is, they will figure it out, their AI will do it for you. They will spend your money where it should be spent to get you to reach your target objective, which you tell them when you set up your account. So yeah, guys. That's it. I really wanted to share that because I know, even myself, I'm still struggling. I'm like, well, do we still bring someone on for this role and have them be in there testing new things and whatnot? But honestly at this point, I don't know. I'm still a little torn, but it seems like if I go in there every couple days and check it, again, going to spend probably 200K this month. We spent at least 100 every month on Facebook, $100 thousand, and it's more profitable than ever while just letting Facebook figure things out. Let me make a side note so people know, I don't want to make it sound like it's the easiest thing in the world, but one of the biggest things that you can do, so in addition to setting up campaigns the way I mentioned in the previous two episodes, obviously this is all assuming you have a great website that converts that people buy from, and it's assuming that you have really good creative in your ads. What I mean by that is either images or videos and your copywriting has to be on point. Everything, this is assuming your business is already working, so you can't just go make this work if you have a website that no one ever buys from to begin with. So just keep that in mind. That's my little disclaimer, before you go and do this. Your website's got to work before Facebook can just drive more results to you. Hope you found that useful. If you did, please do go to ECommerceLifestyle.com, click on episodes, leave a comment, let me know, and I will talk to you all in the next episode of the E-Commerce Lifestyle podcast. See you, everybody.